The developer has finally started work turning it into 22 new houses and 5 tall terraced houses in the old shell. 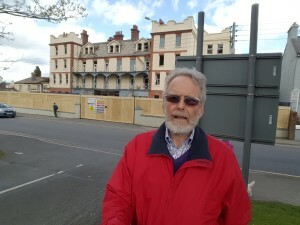 The site has been derelict and an eyesore for 15 years so it is good to see progress. ‘It will be disruptive for those living and working next to it but it does need doing’. The new houses will be timber frame and be made mostly off site and craned into place. This is quicker and less disruptive than traditional construction. Overall it is expected to take 18 months to complete. The first 4 months will be spent knocking down the modern structures and putting in foundations. This will be the most disruptive part though there will be independent vibration monitoring at three locations. Most trucks will use the sea side entrance as the land side road is narrow. The developer met the people immediately adjoining the site, who will be most affected by the work, and outlined the plans. 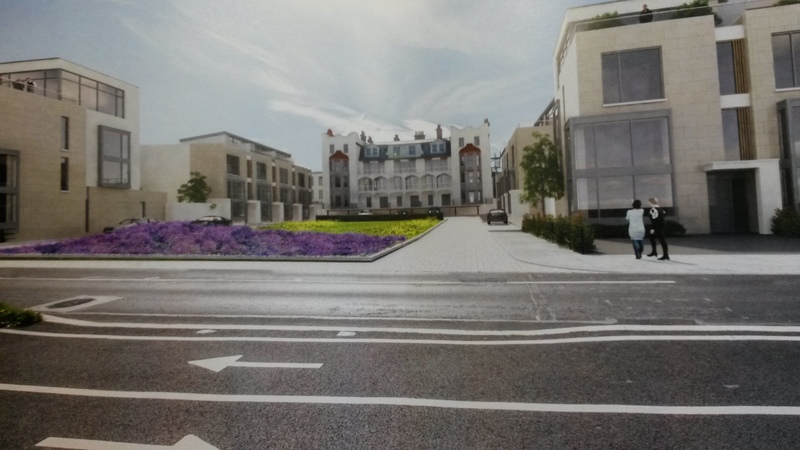 I asked that the images of the completed scheme would be put on the hoardings so that people could envisage the final scheme on this very prominent site. ‘I am pleased about progress and think partly it is due to the Derelict Site Tax and partly the high prices for houses. The recently introduced Tax charges 3% in 2018 and 7% thereafter on sites zoned for housing which are lying unused and is designed get houses built in the current house shortage’ Cllr. Derek Mitchell, Cathaoirleach Greystones District.